From the piste for the piste! Being professionals on the skis and slopes, we know exactly what matters. Quality that holds our promises! Decades of experience for ideal results! 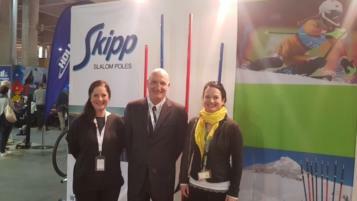 Skipp has always been representative for innovative ideas and high-quality flex poles for slalom ski races, for elaborate safety solutions on and near the slopes and for expertise and know-how in the field of ski sports. Being the former chairman of the skiing club Jochgrimm, owner Gottfried Rottensteiner knows exactly the needs of the coaches, skiing clubs and ski area operators and has over the years been able to adjust his product assortment to their requests. Speaking to the people on the slopes who know exactly what they need for successful, cost-efficient operating in winter sports is still one of best ways to get new product ideas. The small familial business structures of Skipp allow a direct and straight contact to the developers. Thanks to this form of communication on an equal footing, we are able to realise the wishes of our customers as quickly as possible, have our finger on the pulse of the time when it comes to new developments and thus always be ahead of the recent standards. Whether it’s flex poles for the piste, safety fences, special poles for piste marking or crash protection mats – Skipp offers the most innovative technology for high standards. Enhanced since decades, our slalom poles provide ideal conditions for undisturbed training and smooth events. Built up quickly, perfect stability in every snow situation and absolutely rupture-proof.